Huang Annian, a retired professor of American history at Beijing Normal University, casts a ballot in a mock election at the American Embassy in Beijing, China, on Wednesday. 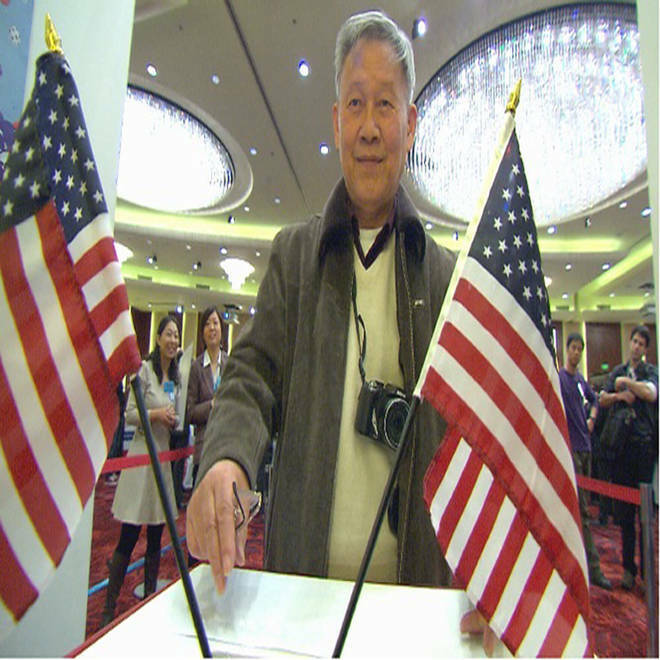 BEIJING — Huang Annian cast his vote this week in his sixth straight U.S. presidential election. But his vote has never been counted. Huang, a retired professor of American history at Beijing Normal University and a Chinese national who has been casting ballots at U.S. election parties in China for about 25 years, said the Obama-Romney race was especially significant. Hosted by organizations like the American Chamber of Commerce and the American Embassy, the events usually include a mock ballot that allow Chinese nationals to cast a vote. That this celebration of American democracy was coming on the eve of a critical, once-a-decade leadership change in China’s ruling Communist Party was not lost on the attendees. It served to contrast the rowdy American election that risked overwhelmed viewers worldwide with too much information, with China’s crucial transfer of power, which has been shrouded in secrecy. Past “election” events have been relatively lavish affairs complete with fully catered breakfasts at Western-brand hotel chains. This year’s was more modest. The 400-plus guests – about 100 Chinese nationals, the rest Americans working in China – were only offered light snacks: muffins, cookies and fruit to go with their coffee. A reflection, maybe, of the austere times the American government is experiencing. Still, there were abundant signs of celebration – balloons festooned the hotel ballroom and TVs were setup with videos that explained how elections in the United States work and what it means to Americans. Chinese guests who participated in the vote appeared to enjoy the pageantry of voting – going into the booth, filling out the ballot and sliding it into the ballot box. By the end of the day many of them were gathering around the booths for photos, “I voted” pins proudly displayed on their jacket lapels. Huang, a self-described American politics junkie in his 70s who blogs regularly about the U.S. elections, was among the first to arrive. Accompanied by his wife, who has attended every one of the election events with him, the two cheerfully marched up to the voting booths when voting opened. In the past Huang has cast “winning” votes for the likes of Bill Clinton and George H.W. Bush. In the final presidential debate, Mitt Romney says the country needs to get tough on China on currency manipulation and counterfeit products. This year? 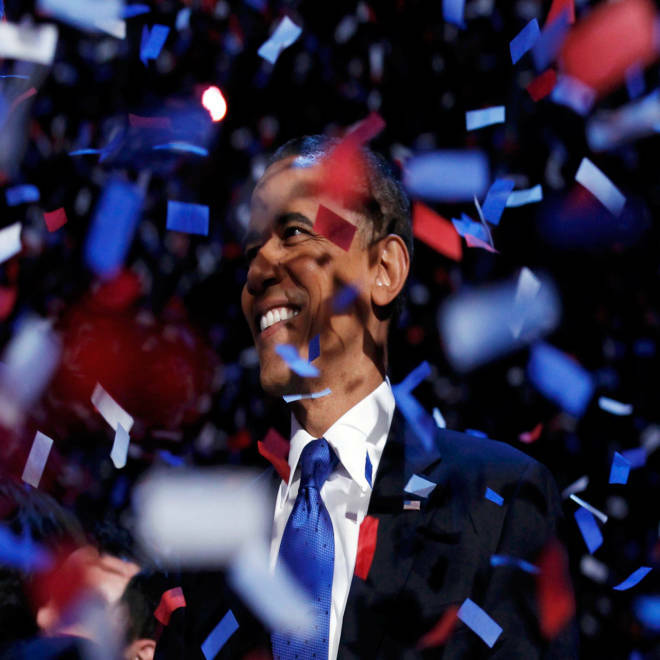 His vote went to the eventual winner, Barack Obama, who won over 150 of the 200 ballots cast at the mock election. All smiles upon exiting the booth, Huang urged embassy staff to invite him and his wife to the 2016 event. But he had a more serious message too, urging collaboration, not competition between the countries. Indeed, when the euphoria of his re-election passes, Obama will face a barrage of issues that will challenge the Sino-US relationship. These range from concerns about trade imbalances that American trade officials say allow China to undercut U.S. competitiveness to Beijing’s concerns about the true intention of the Obama administration’s “pivot” back to the Asia-Pacific region. Despite the tensions between the two countries, Obama appears to have been the choice of officials and academics who attended the party. Neither candidate would have significantly altered the direction of the Sino-U.S. relationship, and Obama provided familiarity and comfort born from experience, professor He Xingqiang told NBC News. “I think both China and the U.S. want to keep stable relations,” the associate professor at the Institute for American Studies at the Chinese Academy of Social Sciences told NBC News after Obama’s victory was announced. NBC News’ Johanna Armstrong and Le Li contributed to this report.